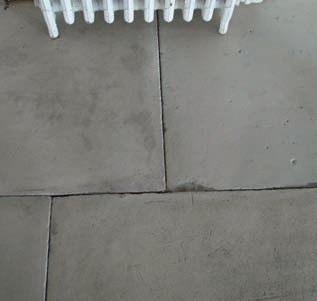 Replicas of very rare and highly sought after grand Antique Smooth Cotswold Limestone flagstones, which were salvaged from a complete hallway floor from a period property in the Cotswolds. They have been replicated to be indistinguishable from the original interior flagstones. Keeping the charm and antique patina characterized by elegance, proportion and symmetry of the Georgian Period. Made from Engineered Stone. We have 30 sq metres available - Size range: 1220x460mm, 1220x490mm, 1400x590mm & 1500x670mm. Depth 30mm Suitable only for Interior Application. Presealed.